Jane Bokenham was b. 7 May 1805 in Southwold, and d. 1852. She was the second of 10 children of Thomas Bokenham (<1774-1846) and Sarah Libbis (<1776-1822), who were married c. 1799. We understand that the Bokenham family was well-recorded pre-1600s as they were [[lords of various manors - to be checked]]. Jane’s father Thomas was a Clothes Manufacturer. The Suffolk Bokenhams have been researched by Patrick Hanson-Lowe (who lives in South London), generating among other things this Bokenham tree reaching back to the mid-1500s. (To find Anthony Jacques Cheeper, search for Libbis, halfway down the document). A Thomas Bokenham (perhaps Jane's brother) owned the Old Swan Inn at Southwold in the 1820s and 1830s. According to a local diary compiled during the early 1800s, several Bokenhams were mariners and at least two including Thomas jr were lost at sea. Anthony and Jane married in 1825 in Southwold. Anthony senior's occupation was Ribbon Manufacturer. Ellen had children right up to the age of 46!? our Anthony Jacques Cheeper (the third Anthony, and the sole surviving male), born on 27 Sep 1837, at 32 Myddleton Square (in Pentonville, North London, north of Kings Cross, near The Angel tube station). His birth was registered on 23 Feb 1838. Anthony senior is on the 'suitor's list' of heads of household in Coventry in 1826. And an Anthony Jacques Cheeper is recorded in the Pigots Trades Directory for 1825/26 in Rotherhithe (East London). This might have been the oldest Anthony, 1758-41, at age 67, or the son Anthony Jacques, 1802-1837; but the son would have been only 23. A decade later, the firm Cheeper, Watson & Jackson is visible in the Directories for 1835, and in those for 1839 and 1846. Anthony Jacques senior was only 33 in 1835, yet the Cheeper name appears first in the partnership. So perhaps the Anthony of 1758-1841 founded the firm. Anthony Jacques is also on the 1834 Voter's List in Coventry (but not on that for 1826). So, during the period 1825 to 1835, Anthony senior appears to have shuttled between at least Coventry in the Midlands and Southwold in Suffolk, but possibly also North London. And his wife and the early, sickly children shuttled at least between Coventry and Southwold. And this was in an era before trains, let alone decent roads and road transport more reliable than horses. No evidence exists of any other Cheeper who could be confounding the inferences. Anthony senior died in 1837, at about 35, and around the time of Anthony junior's birth on 27 September. (But the death certificate hasn't yet been found. This may be a result of the transition date from parish registers to a central register for England and Wales being 1 July 1837). In 1839, Anthony senior's widow, Jane, remarried, to Charles Teakle, who would therefore have been step-father to the 2-year-old Anthony junior and his 7- and 5-year-old sisters. In the 1841 census, the Teakle household was in London, at No 1 Barnsbury Villas, Liverpool Tce, Islington. It comprised Charles Teakle (Merchant), 33, Jane Teakle (30? Actually 35), and our Anthony Cheeper (3), but not daughters Jane Cheeper (then 9) or Ellen Cheeper (then 7), who were living in a school nearby. There were also two FS (family servants?) Rebecca Jones, 25 and Emma Miller,18. Our Anthony Jacques isn't evident in the records concerning the Teakle family after 1841, at age 3. His whereabouts in the 1851 census have not been established (because there's no name-index for the 1851 census). He was presumably away at a school somewhere. (We've considered whether he might have been with relatives - perhaps with Bokenham cousins in Southwold, Suffolk - because he had come into a modest inheritance from the Bokenham grandparents in 1844 or 1846. But we've found no documentary evidence of any of Jane or her family being in Suffolk after Jane junior's birth in Southwold, in 1832/3). He died in Suffolk aged 83, and his will listed dividends, interest and interest of shares along with his estates, which he left to his wife for her lifetime and then to his children. He was 44 when the son was born to whom he gave his own first name and his wife's surname; and he was 79 when his identically-named grandson was born. Edward Cheeper, m. Jane ROYAL, married in 1754. During the period c. 1600 - c. 1850, the surname Cheeper appears to have been inter-changeable with Cheaper, Chipper and Chippar. There are several occurrences of Cheaper, although in most cases apparent mis-spellings by others. The elder Anthony Chipper had a brother Isaac Chippar, baptised 20 March 1763 (both at Mitcham, Surrey, now Greater London), to parents Edward Cheeper and Jane Royal: so the father and two sons are recorded with three variants of the name. A Helen Cheeper was baptised on 23 July 1696 at Leuchars, Fife, father John Cheeper, mother Christian Johnson. But no connection has been found. A non-authoritative reference states that Cheeper is a variant of Chapman (which is by coincidence the name of the suburb where I've lived since 1984). It says “Chapman is common in England and in the United States. Some twenty of the name came to New England before the year 1700. The name comes from the Anglo-Saxon ceapmann, ceap = barter + mann = man. In German it is Kaufmann, with the same definition, supposed to have been given to certain persons on account of their occupations. Chipman, Chapaper, Chipper, Cheeper , are variations. Cognates include Chapelle, Capell (French); Capela (Provencal); Capella, Capelle (Italian); Capilla (Spain); Capela (Portugal); Capel, Van Keppel, Van Keppel (Dutch); Van de Capelle (Flemish)”. We speculated for some years that the name Cheeper may have derived from Jewish migrants, but we've found no evidence to support the idea. One reason was that many Jews were traders (cf. ceapmann). And they had involvement in the East London rag trade, as did Anthony's father, a ribbon manufacturer. Further, the spelling could be an anglicised version of an Eastern European name. Szeiber was one possibility that Anne found on a Jewish site. Sieper is another. A Jewish immigrant family was mentioned in a book entitled 'The Streets of East London' by W J Fishman, maybe c. 1900. A photograph shows an Abraham Cheeper with his wife and family. He was a dealer in clothing of all kinds. When Anne pursued this, it turned out that the man's name was 'Cheepen', and had been mistaken for Cheeper because a photograph truncated the surname on a sign advertising clothing. (I went to visit a man in Devon once because I thought he was a Cheeper, but he turned out to be a Cheepen. We were both disappointed). Anne also found a German-born Anthony Cheeper, mason, in Gateshead in the 1861 census, aged 28, i.e. b. 1832-33. It might also be Cheepen, but looks like Cheeper to us and did to the transcriber. Anne also found in the History, Topography and Directory of Warwickshire 1830 a mention of a James Cheeper, painter, plumber and glazier, High-st. It also has (our) Anthony Cheeper Ribbon manufacturer entered one above. James is probably either a son of Isaac Cheeper (the first Anthony's brother), or of one of his sons' children. The name Jacques clearly derives from the mother of Anthony senior, 1763-1844. It sometimes appears without the 'c', and once, later, as 'Jakes'. Literacy wasn't necessarily a strong-point in the family until the generation that grew up post-WWI. the 2 Anthony Cheepers died in infancy (Anthony George, 1859-1859) and (Donald Anthony, 1910-11). Willie Tony Clarke (1892-1955), the only one successful in terms of longevity (if not wealth). The following few paragraphs follow the Teakle step-family. They are not directly relevant (being merely a stepfather to Anthony Jacques jnr, and possibly for only a very short time). But the Teakles are interesting in their own right. Teakle's father was given as Gentleman on his parents' marriage certificate. Charles Teakle was born in Minchinhampton, Gloucester in 1807, baptised 1810, to Isaac and Sarah Ankle. By 1839, he was a gentleman and clothes manufacturer, located in Coventry and London. 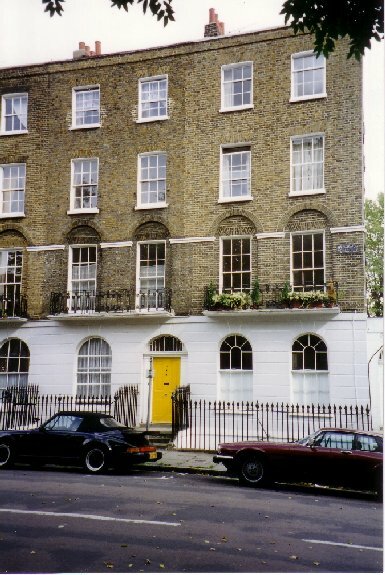 In the 1841 census, the household was at No 1 Barnsbury Villas, Liverpool Tce, Islington. It comprised Charles Teakle (Merchant), 33, with Jane Teakle (30? ), and Anthony Cheeper (3). There were also two FS (family servants?) Rebecca Jones, 25 and Emma Miller,18. In the 1843 London Post Office Directory, an entry shows ‘Teakle Chas esq, 35 Camden Rd Villas', and another in the 1846 London Post Office Directory shows 'Charles Teakle, Watling St., Foreign Merchant'. The household is present in Coventry in the 1851 census, although without our Anthony, at that stage 13. In the 1851 census, Charles and Jane Teakle are at 36 Camden Rd Villas, Kentish Town, St Pancras, North London. With them are Charles and Jane's children (and our Anthony Jacque's half-siblings) Fanny Teakle 9, Kate Teakle 8, and Charles Teakle 6, all listed as having been born in Middlesex, together with Anthony and Jane's children (and our Anthony Jacques's sisters) Jane Chacker 18, born Southwold, Suffolk, daughter-in-law, and Ellen Chacker 16, born Coventry Warwick (together with two servants, Eliza Ewart 25, and Ellen Weymouth, 22). One possible explanation for the strange 'Chacker' surname of Jane's daughters is that they'd married brothers but were still living at home. The surname Chacker appears to exist, but only in the U.S.A. (probably as one of the many inventions of the imaginative Immigration officials on Ellis Island). So a much more likely explanation is that they were unmarried, and that the head of the household, Charles Teakle, created yet another variation on the highly-varied Cheeper name. This could suggest that he tolerated his step-children, rather than embracing them into his household. Then Jane died, in 1852, at age c. 51, leaving Charles with three children aged 10 and younger (together with some remnant responsibilities for the three step-children, then 19, 17 and 15). Shortly afterwards, in 1854, at age 48, Charles Teakle sailed from London on 'The Sovereign of the Seas' to the colonies, arriving in New South Wales on 22 October 1854. His three young children by Jane were aged 12, 11 and 9, and it's unclear where they were at that time; perhaps with one of their step-sisters Jane (19) or Ellen (17) Cheeper/Chacker, or in Gloucester with Teakle relatives. On 2 September 1858, Fanny (16), Kate (15) and Charles jnr (12) sailed on the 'Prince Alfred' from Milford Haven in Wales, arriving in Melbourne on 28 December 1858. The choice of emigration port lends credence to the supposition that they may have been living in Gloucester between 1854 and 1858. Only 8 years later, in 1866, Charles snr died, at age 60, from a disease of the liver. He was an auctioneer. Charles jnr was married to Rosina Whitehouse in 1865, at 19. They had 3 sons, and 2 daughters. One son and one daughter died in infancy, and one son died in 1901, at 36. Charles jnr died in 1878 at age, 33 from chronic disease of the liver and heart dropsy. (He was an auctioneer as well). The two death transcripts state Jane Bokenham late Cheeper as wife/mother. Parts of the families are visible up to the 1940s, so there may be some living Teakle relatives (albeit only half-fifth cousins of Anne and Roger), perhaps in Sydney somewhere. The Sydney White Pages listed 7 subscribers of that name in 2000, suggesting that there were perhaps 10-25 people bearing the name among the > 4 million in the area. We're missing a lot of information; and we'd love to know more!